NETWORK UPDATE: On ABC, THE MIDDLE and MODERN FAMILY gained 0.1, but NASHVILLE lost the same. 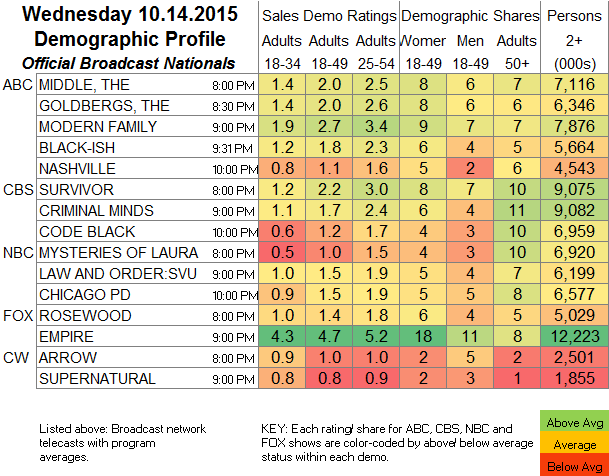 EMPIRE, ARROW and SURVIVOR also rose 0.1 each. CABLE HIGHLIGHTS: FX’s AMERICAN HORROR STORY: HOTEL plunged 0.84 from last week’s season premiere to a still-big 2.15. That was exactly the same drop Week 2 of FREAK SHOW took in its Week 2, so the show is behaving consistently. The primetime Houston/Kansas City MLB PLAYOFFS game on FOX Sports 1 was far stronger at 1.79 than the afternoon Toronto/Texas showdown at 0.87. On Comedy Central, SOUTH PARK was at 0.86, and MOONBEAM CITY was at 0.34. MTV is still listing its Wednesday TEEN MOM airings as “specials,” but this was the 3rd week in a row that it aired on the night, down 0.12 to 0.55, while ARE YOU THE ONE rose 0.04 to 0.43. History’s AMERICAN PICKERS was at 0.46. On Food Network, WORST COOKS fell 0.07 to 0.44, but MYSTERY DINERS gained 0.08 to 0.40. Discovery’s DUAL SURVIVAL climbed 0.08 to 0.43. LITTLE WOMEN LA (Lifetime) held at 0.42. 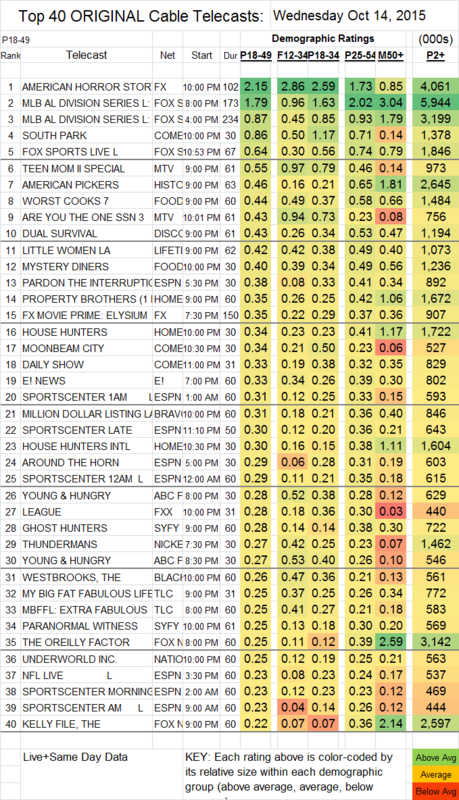 Bravo’s MILLION DOLLAR LISTING was likewise steady at 0.31. On ABCFamily, YOUNG & HUNGRY returned to the schedule with back-to-back episodes at 0.28/0.27, far better than last week’s 0.06/0.05 for a pair of KEVIN FROM WORK episodes. On FXX, THE LEAGUE was up 0.03 to 0.28, and YOU’RE THE WORST dropped 0.04 to a sad 0.08, with 132K total viewers. THE WESTBROOKS premiered on BET at 0.26. PARANORMAL WITNESS (Syfy) edged down 0.02 to 0.25. CNBC viewers got considerably more excited about JAY LENO’S GARAGE, up 0.09 to 0.21. VH1’s COUPLES THERAPY fell 0.11 to 0.20. On DAM, IMPACT WRESTLING dropped 0.03 to 0.06 at 9PM, with 242K total viewers, and added 0.02/85K at midnight, while RING OF HONOR was steady at 0.05, with 174K total viewers.